To call the Oakland A’s off-season aggressive might understate the fervor with which Billy Beane has rebuilt his roster. Already he has signed four major league free agents, exercised two options, and traded for two starters. They add up to nearly $50 million total. Beane would have spent more, too, if he had his way: the A’s reportedly had a $64 million offer to Adrian Beltre. This morning we learned that Beane might not be finished. Reports circulated that the A’s are interested in a swap with the Mariners: Kevin Kouzmanoff “and perhaps a pitcher” for Chone Figgins. Despite the Figgins’s name value, this trade might not greatly benefit the A’s. When word first broke of the A’s interest in Figgins, I thought it would be a worthy addition. He might be a bit expensive, with between three and four years, and $26 and $35 million remaining on his contract, but his production might justify those salaries. While he produced just 0.6 WAR in 2010, he had produced at least 2.7 WAR in each of the three previous seasons, including 6.1 in 2009. If he rebounds even to his 2007 and 2008 levels he could provide the A’s with a solid defensive option at third base, as well as someone who can get on base and cause some disruption on the base paths. Still, we’re talking about two teams swapping third basemen, and that requires a direct comparison of their abilities. That’s when I pulled up their WAR graphs. You might be surprised to see this one. Kouzmanoff has been a fairly consistent producer during the last four seasons. He has produced between 2.5 and 2.9 WAR, with his peak coming last season. Most of his value comes from defense — in fact, the last time he produced a positive WAR batting component was 2007, and it has gotten progressively worse in each successive season. His fielding, on the other hand, has trended in the opposite direction (though we know the warning about looking for year-to-year trends in UZR). It’s not just UZR that rates his defense highly. Both DRS and TZL both have rated him among the league’s best third basemen during the last two seasons. Figgins, of course, is no slouch on defense. He took a hit last year when he moved to second base, but from 2007 through 2009 he ranked among the top five MLB third baseman by UZR/150, TZL, and DRS. He also has the potential to provide plenty more offense than Kouzmanoff: in the last four seasons he has produced a .337 wOBA, compared to Kouzmanoff’s .315. Even so, during those four seasons Figgins has produced 12.6 WAR to Kouzmanoff’s 10.7. There is no question that Figgins is the better player, and we’ve seen him produce big seasons. But does the gap between the two justify a swap, plus an additional player from the A’s? Kouzmanoff has two years left before free agency and will earn $4.75 million in 2011. Last year he was worth almost 2.5 times that. Figgins has three years left on his deal, and that could turn into four if he accumulates 600 PA in 2013. During his best season, 2009, he was worth three times the $9 million he’ll earn next year, but he’s never been worth more than 1.5 times that salary in any other year. It’s a far better bet that we see Figgins produce somewhere around 3.0 WAR in 2011 (which, coincidentally, is what the Fan Scouting Reports pegs him for). Kouzmanoff is also four years younger, which should also play a factor. Based on name value and offensive production, it appears that the A’s would do well to swap Kouzmanoff for Figgins. But after looking a bit deeper I’m not so sure. 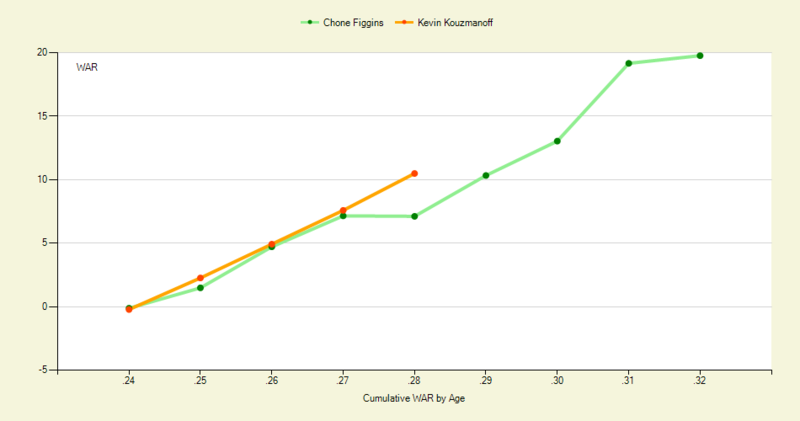 Kouzmanoff figures to be the better value in 2011 and 2012, while Figgins has a fairly hefty contract and is coming off one of his worst seasons in the majors. If cash changes hands perhaps the A’s can make it worthwhile. But in a one-for-one swap, and especially in a scenario where the A’s send an additional player to Seattle, they’d do better to keep Kouzmanoff at third. His numbers might not be the sexiest, but he remains a useful player, especially at his salary. We hoped you liked reading A’s Might Not Upgrade Greatly With Figgins by Joe Pawlikowski! Maybe this shouldn’t be shocking, but I am most shocked that Figgins is 32. When’d that happen? He has been around forever. Figgins was on the Angels’ 2002 WS team. That’s funny because I thought he was like 42.